A wonderful completor piece to your old Johnson Brothers dishes. This is the English oak pattern of a pretty blue oak leaf border trim on white. 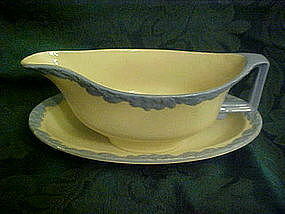 Gravy boat sits in the liner andis not attached. Both pieces are in perfect condition. Stamped Johnson bros (crown logo) England. See other pieces I have listed for this set.